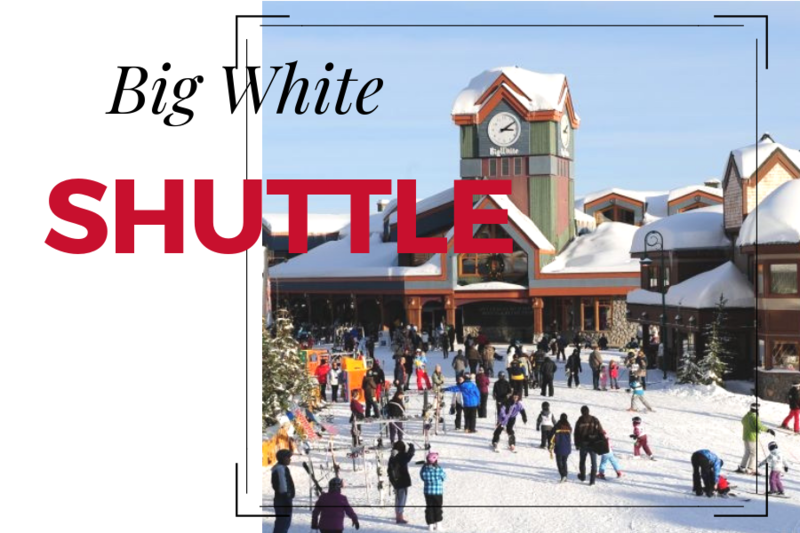 Shuttles to and from the Kelowna International Airport to Big White Ski Resort and Silver Star Ski Resort operate daily throughout the 2018 ski/board season. $70 per person one way or $99 per person return. Minimum 4 guest charge of $280 one way or $396 return, and includes an optional 1 hour Grocery and Liquor stop so you can stock up for your trip, while avoiding the high prices and long walks at the resort. 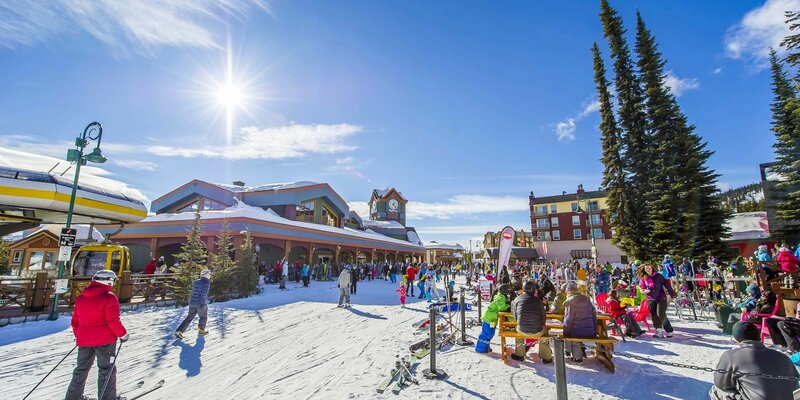 Pricing is per person and shuttle can carry up to a maximum of 20 people, 1 suitcase per person and 1 set of ski or board equipment per person. Private Shuttle and VIP, Private Luxury SUV upgrades are available during checkout. Wheelchair accessible vehicles available on request. or for more information, please call toll free 1-855-717-8452. Sights to experience on the way to Big White. We will exit the Airport and turn South down Hwy 97, whisking through the commercial district of North Kelowna. You may notice Kelowna has one of the only HOV(High Occupancy Vehicle) ‘Right’ Lanes in Canada. Most are on the left. It will be just 7 or 8 minutes before turning left on BC Highway 33. 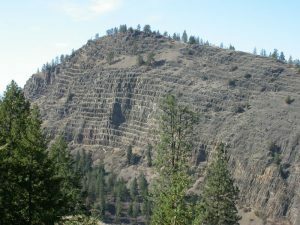 Know as Rutland Road in Kelowna and the Rock Creek Highway outside of Kelowna, as it leads to Rock Creek, BC at the junction of Hwy 3. With a grocery and liquor stop, we will stop in Rutland just before Rutland Road only 15 minutes from the Airport. We’ll then continue Eastbound on Hwy 33 up through Brighton, Toovey Heights and eventually Black Mountain, where on your right (during the day), you will see Layer Cake Mountain. Layer Cake is a volcanic land form composed primarily of Dacite [day-site], volcanic rock with a high silica content. It shows unique layering that has not been seen anywhere else in the world. This is also an area where the devastating forest fire raged through, in 2003, which led to the destruction of 239 homes in the Upper Mission. Most of those homes were in the Kettle Valley and Crawford Estates areas. Twelve wooden and two metal trestles in historic Myra Canyon were also damaged or destroyed. 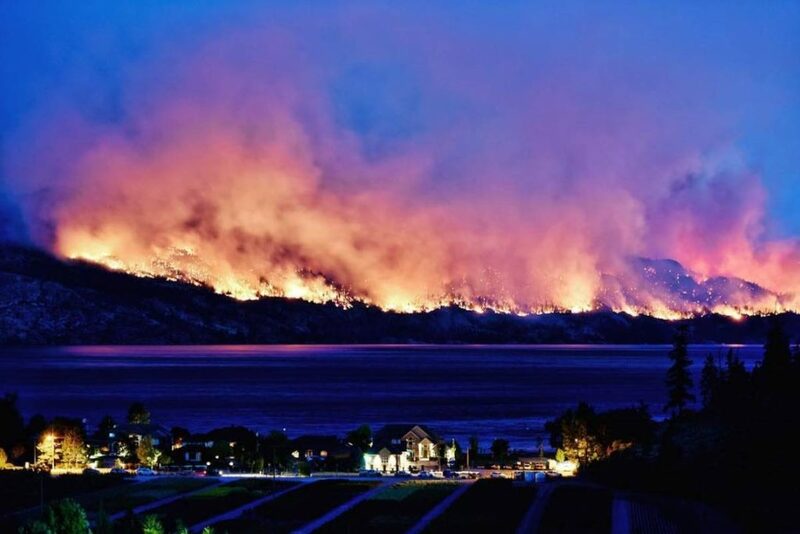 More than 33,000 people were evacuated; 4,000 of those were sent packing a second time as fires raged around them. At one point, it seemed people within the city were either out of their home, or hosting someone who was. The army was sent in to help battle the fires, setting up a makeshift camp on the Apple Bowl and Parkinson Rec Centre fields. At the height of the blaze, which burned through 26,500 hectares, firefighters on the front lines estimated the wall of flame to be up to 400 metres high. As long as we aren’t socked in fog you will also get a cheater view of Okanagan Lake from here back to your right. Okanagan lake is a warm lake over 135kms long and at it’s deepest points is up to 761ft deep. In some points the lake is up to 4kms wide and is also home to the world famous Ogopogo sea monster. Once the lake has disappeared behind us, we’ll be travelling through Black Mountain and then Joe Rich. This fertile Valley is named after the trapper and prospector who settled there prior to 1900. Joe Rich made his home there for many years, but is said to have been a convicted horse thief. Only 20-25 minutes away from Big White Road now. We’ll hang a left there and continue the climb. It’s about 15-20 minutes to the first chair on your left. GEM Lake Express. 10-15 minutes later, we will arrive at your lodging.